This guide is meant for those new to hashing or those that have laid only a few trails. I’ve tried to put together a comprehensive guide, which after my forty years of hashing, will help in laying a memorable trail (if only fleetingly). The suggestions here are examples from BH3. Other hashes do things differently, but there again some other hash trails are long boring races ( we’ve all laid one). This is the traditional Bicester trail. I hope it helps. This guide is meant for those new to hashing or those that have laid only a few trails. I’ve tried to put together a comprehensive guide, which after my forty years of hashing, will help in laying a memorable trail (if only fleetingly). The suggestions here are examples from BH3. Other hashes do things differently, but there again some other hash trails are long boring races (we’ve all laid one). This is the traditional Bicester trail. I hope it helps. 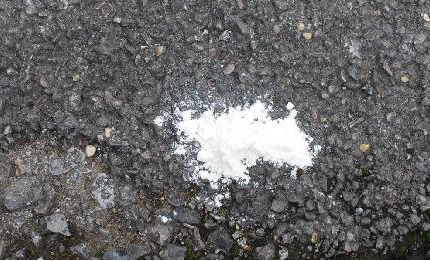 A blob of flour marks the route of the trail. A line of blobs should be easy to follow (to allow the athletic types to stretch their legs), so the blobs should be spaced to suit the terrain. If, for example you are on a long clearly identified bridle path a blob every 30 or 40m will be adequate but in long grass or rough ground you may need a blob every 5m or so. If you intend to change direction the blobs should be clear or use an arrow (shown below). But remember, a not so clear change of direction can be used as a natural check for the front runners. It is up to the front runners to ensure they are on trail, and if they are not, they must to go back to find the trail. A check is a long straight line of flour. Other hashes may use a circle but this is a traditional Bicester check. When a front runner reaches a check the trail ends and recommences anywhere, in any direction within 50-70 m. It holds the front runners up and allows the slower hashers to catch up. Remember the trails starts in any direction so put in the occasional back check forcing the runners to go back the way they came, towards the slower hashers. A really good check can turn a pack inside out, leaving the back markers at the front, and the front runners at the rear. You can put in as many false trails as you wish or none. them up. The real convention is never to trust or believe a hare, even if he announces at the beginning “three blobs and you’re on!? The hare’s task is to confuse the front runners and keep the pack together. An arrow can be used to show a distinct change of direction or to deliberately take the pack away from a hazard, un-cleared land, busy road or suchlike, or even the ‘in trail’ coming back! A back marking hare can also use arrows after the bulk of the pack have passed, to show late comers the route. The On Inn sign points the way to the beer, about 400 metres or so from the pub indicating the end is neigh. The route to the pub from this sign should be clear and unambiguous, so no hasher can get lost in between! The hash cannot survive without everyone taking their turn to be a hare and lay a trail, either alone or with another hasher. It is always sensible for a new or inexperienced hare to join up with one of the old lags to lay a trail, so tips and ideas can be passed on (both ways). It is quite challenging to lay a good hash trail. It is not like a park run where everyone knows the way, and the fastest come in first and the slower ones come in later, nor is it a three mile circular race. The task of the hare is to design a none competitive trail, using a combination of checks, loops, and short cuts to try to keep the pack together, mix them up, and aim to get them ALL back to the pub at about the same time. More importantly, it should be fun. To achieve this takes careful planning and at least some knowledge of the area and a bit of work, but it can be highly satisfying to see a pack of hounds working their way around a trail, outwitted and confused, until they eventually find their way to the beer! The objective of the hare is to lay a flour trail from the pub and that ends up back at the pub they started from. The trail should take between 1 hour and 1 hour 15 mins to walk / run with checks, false trails, loops and shortcuts to allow the slower runners to catch up and walkers to cut parts from the route if preferred, thus keeping the pack together so we all arrive back at the pub within say 15 minutes of each other. Bicester Hash runs at 7pm on a Monday evening during the summer months and during the winter months, every Sunday starting at 11 am. We mainly hash in the country side, laying trails from country pubs making use of the vast public footpath network and other public rights of way. Sometimes, usually late summer when daylight becomes an issue, we run in town but try to avoid running on tarmac or concrete. What a hare has to do. ∙Choose a pub, preferably with parking, and inform the hare raiser. ∙Clear the pub with the landlord well in advance that it is OK to use his pub as a hash venue. Warn him/her that there will be a 20 or so people using the carpark and then guzzling his/her beer. This ensures the landlord has real ale or extra bar staff. You may even be able to blag some free food, but the hash will pay for it if it’s cheap. Consult Hash Cash. ∙Find a suitable trail from and back to the pub. To do this you will need an Ordnance Survey map of the area, showing definitive Public Rights of Way. Many people now use on line mapping, but an OS 25000:1 Explorer map is ideal. They provide a large area and scale whereas portable online maps can be limited to a screen size. These devices are excellent whilst laying and following a planned trail, pinpointing your position, but in the actual planning they are limited. Sit in the pub with a pint and the map and mull over the proposed trail. ∙Walk the trail at least once to check out the terrain and obstacles; what would be good to run through, or not. Perhaps a water crossing or plenty of shiggy can be incorporated. A bog is ideal! You should be able to walk it in about two hours. Consider where hashers will get spread out and where you will need checks or where short cuts need to be made. Don’t be afraid to make changes after seeing the lie of the land. Incorporate, if possible, loops, three sides of a field, zigzags, anything that will slow the front runners and encourage slower runners/ walkers to take short cuts. Indicate with a W and an arrow if need be. (Some hares give slower walkers a map). Generally get the trail organized in your head. Note any livestock or any parts off rights of way. helpful. You may even get a cup of tea and permission to go on usually inaccessible land. There are numerous ways to hold up the front runners, most have been tried over the years; nearly all of a theme, but the tenet is to keep the trail simple. The over-complicated may seem good in the planning but add a pack of half-wit hounds and it all goes pear-shaped. Remember you’re dealing with hashers (who are, by definition, half-wits,) and you should be OK. Here are some, oft-used examples that rarely fail to work. ∙It will usually take two hares at least 3 hours to lay the trail and will use about 4/5 bags of flour. (Get the cheapest). ∙Try to lay a trail as late as possible prior to the hash. This will eliminate the possibility of it being washed away or sabotaged. ∙Before laying the trail consider hiding flour on the route so that you have less to carry with you. ∙If laying a trail in built up areas (towns and villages) be wary that our markings can cause concern to residents. Lay smaller markings and more sparsely. Only put markings on the kerbside of pavements, and not on peoples’ property, land, posts, walls etc, and not directly outside gates or front doors. Be considerate. If approached explain fully who you are and why you are marking the trail. Refer them to our website. ∙Before the off brief the pack on obstacles, problems, livestock etc on trail. Let those with dogs know when they should be on leads. The law states that on rights of way dogs should be under close control only, but in livestock they should always be on leads. ∙Lost hashers. It is the hares’ responsibility to find them! ∙When everyone is back your responsibility ends and the RA should be awarding you a well-earned down-down. Except of course for getting your name down for your next haring adventure. ∙A final thought. Bicester hash has only survived because of the goodwill of landowners and landlords. We have all met the occasional ‘difficult’ one but we hash a large area, there’s bound to be one or two; always be courteous. Move on, get round the corner where you cannot be seen, and stick two fingers up, repeating that old refrain : “ Landlords and Landowners come, Landlords and Landowners go, but the hash goes on forever.